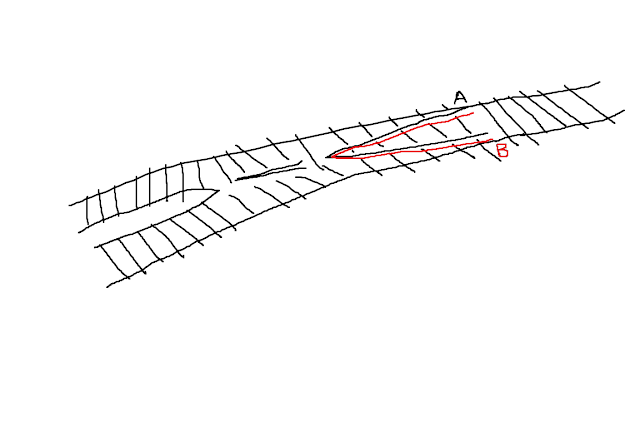 Here is a tip for modifying a Peco set of points (or turnout, as some people call them) when using a Tortoise points motor. The Tortoise is so called because it changes a set of points in a slow continuous movement from left to right and then back again from right to left. This contrasts with solenoid type motors which flick the points with a single jerk from right to left and then back again. But, in order to accommodate that slow movement, one must first remove a little spring which is built into Peco turnouts and whose function is to hold the position of the points blade in either its far left or far right position. Either A or B in this diagram. Clearly, the blade must be securely held against either A or B - if it wobbled back and for then a passing train would be derailed. The spring serves that function of securing the blade. 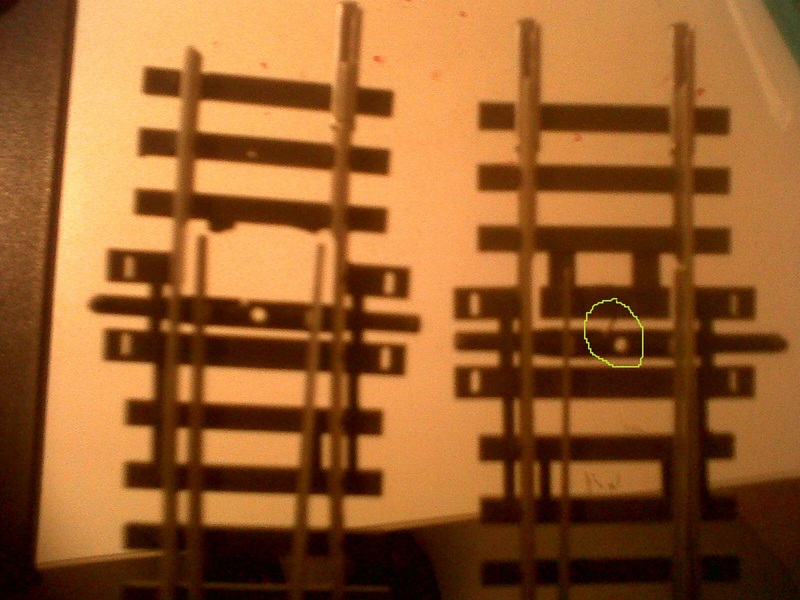 When I built my test layout I removed only the spring itself - which looks like a little copper blade and joins to the switching bar - in the photo below, the switching bar is the cross-member which has a little hole in its middle and I've circled the little spring in green. But this leaves the spring's housing to flop about and that housing can foul the movement of the blades. So, I suggest removing that housing as well. You'll infer from the gap in the left-hand set of points where and what the housing is. 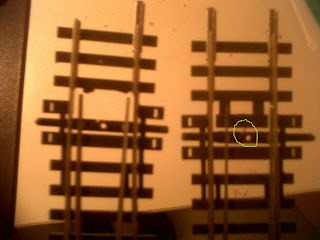 You will notice that without the spring in place, the blades in the left hand set of points can freely hover in between the rails. The Tortoise motor makes sure that they are either to the left or to the right. This duo (one German and the other Bosnian) recorded "Freaks and Icons" in 2000. Tony Blair seems to have been involved in some way or other! "This album is a gem in its own right! A wonderful masterpiece of early down-tempo tracks weaving a multi-cultural soundscape through your ears, balanced by a mix of dance tracks and cool kick-back-and-relax tracks...the kind of album you can play from start to finish and feel like "Awww shucks" when the final track closes! Both artists come from proper musical trained backgrounds, brought together by a love for middle eastern sounds, especially that of Turkey. Such inspirational sounds are not sampled into the music, as with many other producers, but is created and re-interpreted by themselves, giving such influences a new and fresh expression. These musicians are definitely talented...to the point of not over-doing it!" For various reasons, I have this CD installed on two ancient Dell laptops that I use exclusively for clients' work. Therefore, when I periodically tackle their work, Freaks and Icons is one of the CDs I find myself listening to. I can honestly say that over the last 10 years I have grown to love this album more and more. Is 'growing to love a piece of music more and more on repeated listening' a sign of a really good work?